The physical therapy (PT) profession is more than an occupation. It is a lifestyle and journey full of heart, love, and compassion for our fellow neighbor, near and far. The PT profession focuses on enhancing movement and improving daily function through our hearts, hands, and minds. With love and compassion, we transform how people engage with the world and how the world engages with them through movement. Movement is the oldest and closest commodity of life. It opens us up to run, to play, to dance, to cook, to live, to love. In striving towards our mission to increase access to quality rehabilitation medicine and our vision for a clinic in every community, and community in every clinic, we seek to empower innovation and servant leadership through our critical mass of awesome people in our Catalyst Club. Catalyst Club is a way for you to intentionally engage in responsible stewardship of the resources within and before you in a viable and palpable way towards our mission and vision, the PT profession, and beyond. Catalyst Club has three pillars for members to involve themselves in for a more active and intentional role to help increase our capacity as we strive to fulfill our global mission and vision. With a collaborative and collective family of diverse and dynamic people, we will catalyze sustainable and responsible change in communities around the world. And you as a member are offered a bidirectional opportunity to be fulfilled in service and to fulfill others through service. Your membership in the Catalyst Club comes with effecting responsible stewardship in at least two of the three pillars: financial sustainability, service participation, and/or operational support. The active role with each pillar opens the mind and heart to innovative ideas to share, to learn, and to transform lives through the love and compassion of physical therapy. Financial sustainability challenges you to think outside the box in development of a fundraiser and/or to pause and think how you can maximize the benefits and worth of your money by giving monthly to Move Together. Danielle Cardinale, PT, DPT with Baptist Health Physical Therapy in Louisville, KY, raised money and promoted the 2017 Villa Nueva clinic development project in celebration of her clinic’s one-year anniversary. She raffled off an opportunity for a client to put her through a 30-minute workout of their choice. Watch the video below that captures an essence of the relationship and compassion bidirectionally shared between the patient and the physical therapist. For additional inspiration and creative ways to fundraise, take a moment to read last month’s blog post, Empowering & Transforming Lives Together through Challenges. Service participation focuses on leading and/or participating primarily in our annual Global PT Day of Service (PTDOS) for a transformative experience that transcends the day and the profession. PTDOS is a dynamic day that opens individuals, communities, and the world to enact sustainable, transformative, transcendent change in one’s local community for a global effect. Transformation occurs across three cogs: the person(s) serving, the end beneficiary(ies), and the community, and was the focus of Global PTDOS 2018, which happened on October 13. This year the American Physical Therapy Association’s (APTA) National Student Conclave (NSC) coincided with Global PTDOS. And since transformation and change come best through collaboration and collective actions, the APTA, ATI Physical Therapy, and Move Together joined together to offer the students at NSC a unique opportunity on Friday night, October 12, in support of PTDOS. 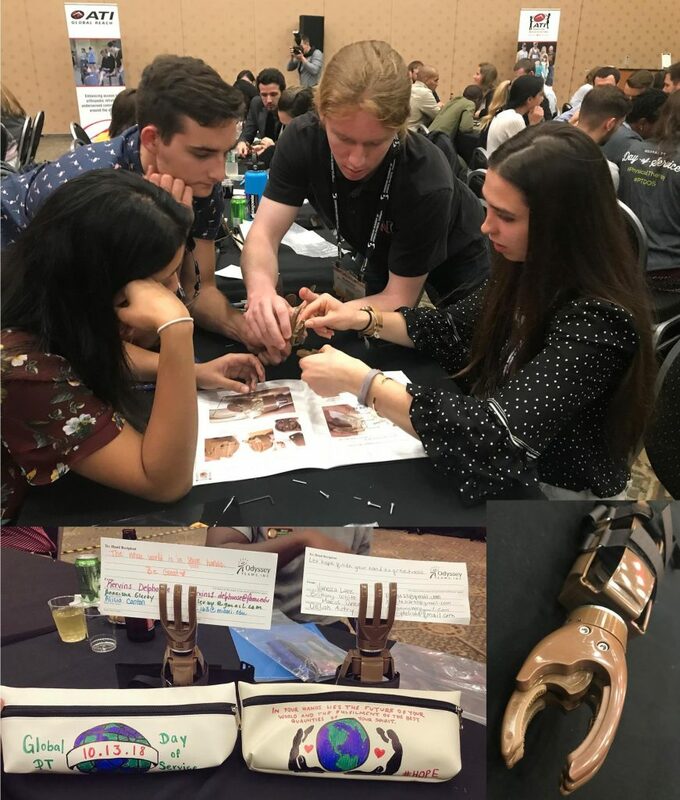 Nearly 250 students worked together to change the lives of amputees affected by landmines and other hazards in developing countries by building 70 prosthetic hands and sharing experiences and knowledge with one another in the process. The time is never too early to start ideating for Global PTDOS 2019 or working to enhance and sustain the efforts of 2018. For more ideas and resources, take a moment to read about Empowering Children, Elementary Schools, & Physical Therapists led by the Chattanooga Tennessee Physical Therapy Association and check out the PTDOS website & blog. Operational support brings to life your passion and special gifts to influence our programs and projects in collaboration with our team in fulfilling our mission and pursuing our vision. Our capacity to effectuate change around the corner and around the world necessitates supportive hands, minds, and hearts across the globe with a diverse set of gifts and backgrounds. Over the years, people have supported in clinic building design; capturing the impactful stories in pictures, videos, and words; developing and cultivating relationships with sponsors, global partners, and participants aligned with PTDOS; being a pro bono incubator mentor; or helping design the pro bono playbook. 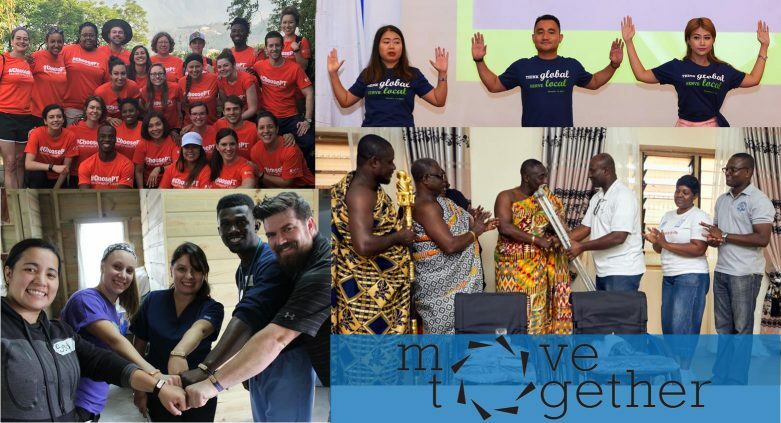 Based on your passion, interests, and gifts and our needs, we will engage you in our programs, projects, and backend logistics so we collectively can transform the world by maximizing movement for a healthier community and world. The video below by Dan Anderson from our January 2018 Guatemala experience is an example of how one might lean into our mission and vision. We are “making the improbable, probable through collaboration” as Manny Acheampong shared after his week in Villa Nueva, Guatemala treating and working together with local PTs and English/Spanish translators as part of our clinic development program. We are excited to expand the PT profession and access to quality rehabilitation medicine around the corner and around the world with you. When we come together to help maximize movement, we maximize lives and engagement with the world. In maximizing lives, we transform communities and thus transform the world. As we advance the PT profession with you are friends and family at home, we advance the profession around the world. And a better profession around the world is a better profession and life locally. To sign-up for the Catalyst Club, click here. If you have questions regarding the Catalyst Club, check out the website or email us at catalystclub@movetogether.org. If you have other questions or want to learn more about our other programs, check out the different programs on our website and feel free to reach out by clicking on contact above to complete an interest form.